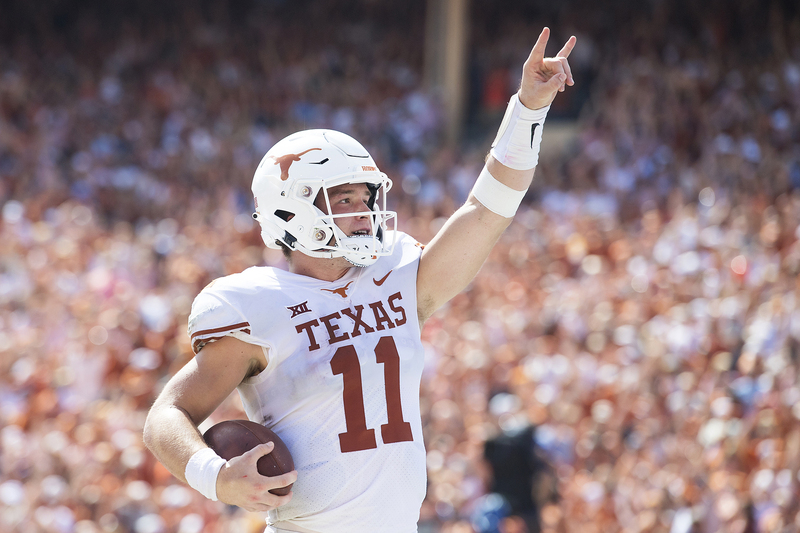 Texas football head coach Tom Herman said he that if healthy, Sam Ehlinger has earned the right to remain the Longhorns' starting quarterback (photo courtesy of texassports.com). AUSTIN, Texas — The Texas Longhorns are this close to earning a berth in the Big 12 championship game, with a road win Friday over hapless — but improved — Kansas the only thing standing in the way of the Longhorns and trip to Arlington. Of course, there was plenty on the line the last time Texas traveled to Lawrence, as well — mainly the continued employment on the 40 Acres for then-coach Charlie Strong. Things didn’t go as planned for the Longhorns that cold, blustery day, as the Jayhawks won in overtime and Strong, after a season-ending loss at home to TCU six days later, was sent packing. Fast-forward to today, when the Longhorns (8-3 overall, 6-2 in Big 12 play) already have won more games than they have in a season since 2013 and are ranked at No. 11 in the country in this week’s Associated Press poll and No. 15 in the College Football Playoff rankings. Despite being an overwhelming favorite to clobber Kansas, the Ghost of Lawrence Past hangs over the Longhorns as an example of a situation when everything that could go wrong did. Texas coach Tom Herman said Monday that he has not even considered using that loss to Kansas in 2016 as a motivational tool to make sure there’s not a repeat performance this season. “I feel like that was 50 years ago, not two years ago,” Herman said during his regularly scheduled Monday media availability. “We're so far past that point in our program that, no, there is no hidden significance of it. Texas handily beat a gritty Iowa State team last Saturday to put itself into the position to earn that spot in the league championship game, and did so by returning to the physical style of play that earned it a six-game winning streak earlier in the season. “Iowa State, we feel like, is the second-most physical team in the Big 12,” Herman said while considering his own team the most physical. “So we knew we were going to have to match and or exceed their physicality to have a chance in that game. Herman said that the shoulder injury suffered Saturday by quarterback Sam Ehlinger was a re-aggravation of the injury Ehlinger had about a month ago in the Baylor game, and was not as severe as the first. Herman said he fully expects Ehlinger to start and play most of the game Friday against Kansas. “We're going to play the best players, the players that give us the best chance to win, regardless of opponent,” Herman said. “Sam has earned the right that, if he is healthy, to start the game, he will. He's proven that he can win really big ballgames for us and perform that way, and we're going to need our best to win. • A change in practice routine for the week, based on the fact that the Iowa State game was so physical and that because of the short preparation time heading into the Kansas game Friday morning. “We won't approach the game any differently, but we will approach practice differently,” Herman said. “Yesterday's practice, instead of a normal Sunday, which is helmets and the little shoulder pads, was a walk-through with no helmets and tennis shoes. (Monday) will be full pads. We need it, and we need to continue to tackle. You saw the benefit of that from our defense from going full pads the week prior, but we will be on the field less. • In a repeat of a question from Big 12 media days, Herman was asked how many elite players he thought the Longhorns have on their roster. He responded, again, that he doesn’t keep a running tally of elite players. • Texas has been ranked for nine consecutive weeks, its longest stretch since being ranked in 162 straight polls from 2000-10. • Friday's game, to be played the day after Thanksgiving, marks the Longhorns' first Thanksgiving game (or the Friday after) played outside the state of Texas since 1934, when Texas played at Arkansas the Friday after Thanksgiving. It also will be the Longhorns’ first non-home game, or non-traditional matchup with Texas A&M, on Thanksgiving or the Friday after since the Longhorns played at Baylor on Thanksgiving in 1994.